Sine 2013, the Moving Arts Lab has served as a continuation of the IIAC residencies, affording artists the opportunity to share their research with a wider community of participants through a festival meeting ground of interdisciplinary exploration. Offerings include 21 workshops, an open dialogue session, and faculty performance. This ​August 22-25, 2019 the Moving Arts Lab will celebrate its 7th year! 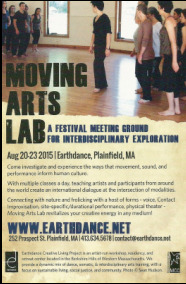 We have generously been hosted at Earthdance in Western Massachusetts since 2013. For more information and to register, please click here. After teaching and performing in the Western Mass Moving Arts Festival (WMMAF) at Earthdance in Summer 2011, Peter was invited by Earthdance's former Executive Artistic Director Krista DeNio to join the Programming Committee. The opportunity included the option to curate a residency. Extending the idea of the labs, Sciscioli was able to schedule the first IIAC residency directly before the WMMAF 2012, for which he also served as co-curator. In 2013, Peter was invited to take the lead on curating the WMMAF, and proposed altering the name to the Moving Arts Lab in order to reflect a more international roster of teachers and to encourage more experimentation and exploration within the workshops. To see photos from the Moving Arts Lab 2013, please click here. To date, the Labs have been held during a weekend in the summer at Earthdance, and have included a total of 21 workshops each year and a faculty performance open to the public. in 2014, a dialogue session between IIAC residency artists, teachers and participants was introduced. 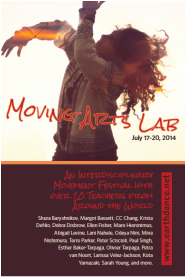 To see photos from the Moving Arts Lab 2014, please click here. In August 2015 the Moving Arts Lab served as a full extension of the IIAC residency, providing each of the participating artists an opportunity to facilitate at least one workshop during the weekend. A dialogue session, focusing on new language to describe interdisciplinary performance and practices and identifying creative models for exchange and engagement with a broader public, took place between IIAC artists, Earthdance staff and participants in the Lab. A faculty performance, showcasing a range and depth of interdisciplinary approaches, was also offered. 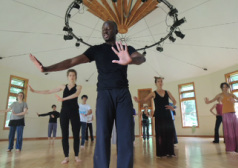 To see photos from the Moving Arts Lab 2015, please click here. 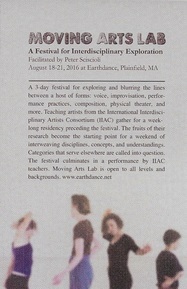 From ​August 18-21, 2016 the Moving Arts Lab celebrated its 4th annual offering at Earthdance in Western Massachusetts, serving as both a continuation of the IIAC residency August 14-18 and as a festival meeting ground for interdisciplinary exploration, with 21 workshops, an open dialogue session, and performance by Lab facilitators from around the world. For more information, click here. To see photos from the Moving Arts Lab 2016, please click here. In July 2017 the Moving Arts Lab turned 5 years old! From ​July 20-23, 2017 the Lab served as a continuation of the IIAC residency, July 16-20, and as a festival meeting ground for interdisciplinary exploration, with 21 workshops, a new embodied dialogue session, and performance by Lab facilitators from around the world. For more information click here. 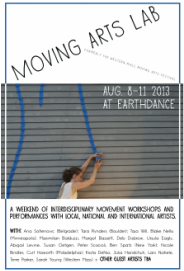 From ​August 23-26, 2018 the Moving Arts Lab celebrated its 6th annual offering at Earthdance in Western Massachusetts, serving both as a continuation of the IIAC residency, August 19-23, and as a festival meeting ground for interdisciplinary exploration, with 21 workshops, an open dialogue session, and performance by Lab facilitators from around the world. Participants gathered from Australia, California, Canada, England, France, Florida, Jamaica, Maine, Massachusetts, New Jersey and New York! For more information, please click here. For more information on each year's offerings, including the schedules and roster of teachers, please click on a corresponding image to the right.